The guides in this series by Tom Wright can be used on their own or alongside his New Testament for Everyone commentaries. Paul s first impression of the Thessalonian Christians was an especially powerful one: the gospel message he preached captured their hearts and minds, and transformed their lives. The young church, bubbling as it was with a sense of the power of the living God, moved Paul to write of the importance of remaining faithful and continuing to look for Jesus return. These studies seek to open our lives to the God who is our future and our hope. 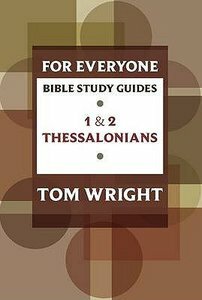 About "1 & 2 Thessalonians (N.t Wright For Everyone Bible Study Guide Series)"
Order now to secure your copy when our stock arrives. Other edition is available. 9780281065059 0 Available. Expected to ship in 6 to 7 weeks from Australia. The guides in this series by Tom Wright can be used on their own or alongside his New Testament for Everyone commentaries. They are designed to help you understand the Bible in fresh ways under the guidance of one of the world's leading New Testament scholars. Thoughtful questions, prayer suggestions, and useful background and cultural information all guide you into a deeper understanding of the Christian story and the Christian life. Illness and suffering in the ancient world were regularly regarded as signs of divine displeasure. Sometimes we think the same thing today. In 2 Corinthians, we see evidence of Paul's own suffering. The difficulties and pain he endured could be interpreted as God's punishment. Not so, says Paul. Trials come not because God is angry; rather, he requires us to trust him completely. Paul was breaking new ground here. He wanted the Corinthians to understand the comfort to be found in the suffering, death and resurrection life of Jesus. Order now to secure your copy when our stock arrives. Other edition is available. 9780281063796 0 Available. Expected to ship in 6 to 7 weeks from Australia.